Recently, I got the urge to dust off and fix my Korg Mono/Poly’s keyboards. They are notorious for not making contact after a while! 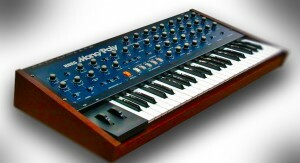 This was my first synth and I spent hours/months trying to learn synthesis using it. It was used by all the notable electronic composers of the time such as Vangelis, JM Jarre, Tangerine Dreams, and Klaus Schulze. It has four VCO’s which can be shared in four-voice Polyphonic mode, or linked in Unison for a versatile monophonic lead. Each VCO has its own level, tune, and waveform type control. Waveforms include triangle, sawtooth, variable pulse wave. It has a great VCF (filter) section as well as two envelope generators (one for the oscillators and one for the filter). There are also 2 individual LFO’s which can be used to modulate the Pulse Width, envelope and Arpeggiator independently. Also included are chord memory and an effects mode in which oscillators have a variety of ways to be synced. The built-in arpeggiator and sequencer (very basic) can run all 4 VCO’s at a time or cycle through each voice per note! There’s also portamento, CV/Gate, VCF and VCO mod inputs, white noise generator, and the pitch/mod wheels can be assigned to control LFO, pitch or the filter. Its sound quality is nice and very Korg. I used to use a Roland 100 note analog sequencer with it and synchronized it using a drum machine clock. Will let you know, how the repair will go soon! This entry was posted in Analog, Electronic Music, Music, Synthesizers and tagged Analog, Korg, Korg MonoPoly, Music, Synthesizers. Bookmark the permalink.